In the heart of the West Virginia hills, at the edge of the Little Kanawha River Basin, is Oil Creek with its several tributaries. It was first settled at the beginning of the 1800s. At the confluence of Clover Fork & Oil Creek the town of Orlando developed in the late 1800s and withered in the mid 1900s. For two hundred years a small community has loved, worked, fought dreamed and worshiped here and raised new generations to do the same. Here are some of the stories of that community. The crusty white Ardennes snow was stained with patches of crimson red. Tomorrow the stains would be black and replacement troops would never know something dreadful had happened there. Tree limbs littered the ground beneath the large fir trees. The squeal of the Panzer tanks, the rattle of machine guns, the crack of a sniper’s rifle, and the whistle and shattering explosions of German 88 mm’s were discomforting sounds for Pfc. Fred Ocheltree and the men of the 301st Infantry Regiment. These terrible sounds of war were nearly as discomforting as the intense bone-chilling cold weather to ill-clad infantrymen sleeping on ground so frozen that foxholes couldn’t be dug with an entrenching tool. Infantrymen were always the closest to harm’s way and most likely to die. Many felt that death would be a welcome relief from the unnatural cold. The Battle of the Bulge took many a good man. American forces suffered 80,000 casualties during the last great offensive by German troops during World War II but it seemed that Orlando was seeing more than its share of bad news from the War Department. On February 1st, 1945, Dr. Ord and Effie (Ocheltree) Conrad received the sad news that their son, Sgt. Everett Conrad had fallen victim in the dark and freezing Ardennes forest to the German onslaught. This news was also distressing to Oley Ocheltree who was Everett’s uncle. On February 7th, 1945, Worthington Hurst, Sr. and Jeanette (Skinner) Hurst were forlorn recipients of a Western Union message advising that their son, Junior Hurst, was killed in battle. That same day, the grieving Oley Ocheltree also received a telegram from the War Department advising that his youngest son, Fred Ocheltree, was also killed in combat during the Battle of the Bulge. These were dark and distressing times for the Orlando community. 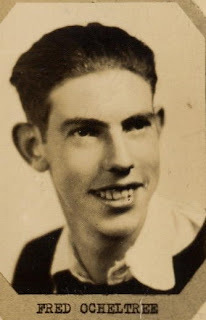 Fred Ocheltree’s high school classmate, Kathleen McPherson, described him as “tall and gangly,” echoing the very same words used by Dale Barnett. Kathleen recalled that Mr. Moore, the principal of Burnsville High School, used to tease Fred about being so quiet. A quiet, respectful disposition was an Ocheltree family trait, according to Dale Barnett. Fred was born in October 1922, the son of Oley Ocheltree and Ellenora (King) Ocheltree. His father, Oley was well-known in the central West Virginia area and had clerked in Beamer’s Store and Collins’ Store in Burnsville, Charlie Knight’s store in Orlando and had operated his own store on Clover Fork at Blake. When he clerked for Charlie Knight in the early 1930’s, Oley and his family lived in a house just east of St. Michael’s Catholic Church which had formerly been the original Dolan Hotel and Michael Rush home. Fred had five older siblings: Sylvia, Hugh, Edward. Virginia Lucille, and Edna. His brother Hugh had been murdered during the early 1930’s on Riffle Run and the failure of authorities to locate his body was the cause of much grief for Fred’s father and his family. Fred’s mother, Ellenora, died in 1924 when Fred was but two years of age. Fred was a 3rd cousin of brothers Lydle Ocheltree and Bacil Ocheltree of Chop Fork, since their respective great grandfathers, James Isaac Ocheltree and Alexander Ocheltree Jr., were brothers who pioneered Clover Fork. During Fred’s senior year at Burnsville High School in 1942, cousin Lydle became one of the earliest volunteers to respond to the Japanese attack on Pearl Harbor, enlisting in the Army Air Corps. Bacil also joined the Army Air Corps in October 1942. Although Fred was over nineteen when he graduated from Burnsville High School in May of 1942, he somehow was lucky to avoid the clutches of the draft board lottery which was drafting boys out of high school. Shortly after high school graduation, however, the call of duty took Fred to the army recruiting station for enlistment in the United States Army. Pfc. Fred Ocheltree and the 94th Infantry Division finished training at Camp McCain, Mississippi in July 1944. The invasion of Europe at Normandy by the Allied forces had commenced four weeks previously and reserve units in the United States and England were being readied to relieve the initial invasion forces. Trains transported the 94th Infantry Division from Mississippi to the New York wharves and discharged Fred and his comrades directly onto the Queen Elizabeth passenger liner for the trans-Atlantic voyage and the waiting European battle grounds. Chroniclers of the trans-Atlantic voyage of the Queen Elizabeth recalled that prior to boarding the huge passenger ship, Red Cross ladies gave the infantrymen packages of soap, a toothbrush, a razor, and a Perry Mason mystery book. Regrettably, the same Perry Mason mystery book was given to every passenger so there was no trading after the book was read. Breakfast and dinner on board the ship was the same: boiled fish, a small boiled potato, toast and marmalade. Such a diet would not have added an ounce to Fred’s thin frame. Five days after leaving New York harbor, the Queen Elizabeth docked in the Firth of Clyde in Scotland and the infantry division was loaded onto waiting trains which rushed the soldiers through the English countryside to southern England. After arriving at the English port of Portsmouth, the division trained for a few weeks in the surrounding rolling hills. On September 8th, 1944, the division was loaded onto ships and taken across the English Channel and off-loaded at Utah Beach. Immediately upon landing on French soil, the 94th Infantry Division relieved the 6th Armored Division which was then engaged with German forces in Brittany in the area of Lorient and St. Nazaire. 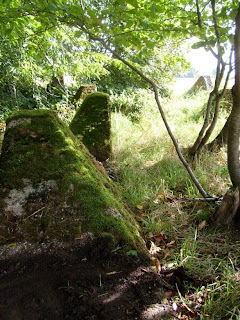 This pocket of German defenses had been bypassed by the original American invasion forces. 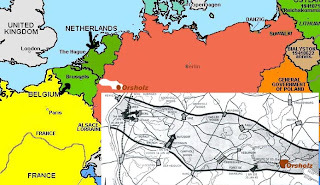 The 25,000 German troops defending this area were eager to fight and had inflicted heavy casualties on the 6th Armored Division which had given as much as it took. The fresh 94th Infantry Division and Fred’s 301st Infantry Regiment was thrown into the thick of the fighting and by late fall the German occupation of the area was over. As winter of 1944 seized an icy hold onto the French countryside, Fred and his 301st Infantry Regiment were entrained, weary and without winter clothing, to the front lines near the Saar-Moselle Triangle and the Siegfried Line. Entrenched German forces, a dreaded pillbox defense, and the famed German 11th Panzer Division awaited the American infantry men near the German town of Orscholz. American intelligence was unaware of the presence of the German Panzer division which had recently been transferred from the Russian front. Moreover, American intelligence had no clue about the coming German offensive which would become known as the “Battle of the Bulge.” Fred and the 301st Infantry Regiment were at the southern end of the “Bulge,” and the fierce fighting and bone-chilling cold was about to take their toll. The assault on Orscholz began on January 20, 1944. The 301st Infantry Regiment began advancing through the forest and was met by German machine guns. Germans had camouflaged pillboxes to look like houses and had utilized fallen trees as cover to fire upon the American infantrymen. Mine fields impeded the American advance and snow was a foot deep. The fight to take Orscholz lasted nearly two months at a great cost of lives. One writer observed that because of the freezing cold a wounded soldier received a sure death warrant if he received no immediate first aid. Right; The insert is the Seigfreid Line. the white line on the map of europe shows where the seigfreid line was located. Orsholz is printed on both maps in brown. Click it to enlarge. Left: Some of the fortifications remaining today at Orsholz: cement barriers that would hang up tanks, making tank support useless. For a memoir of the battle at Orscholz see The 94th Infantry Division, 301st Infantry Regiment, at Orscholz. We don’t know for sure how Pfc. Fred Ocheltree’s young life ended on the ground before the tiny village of Orscholz; it really makes no difference whether it was by shell or bomb. He was a nice young man of promise who had lost his mother to diabetes when he was two; had lost a brother to murder when he was ten, and on February 7th, 1944, he fell on foreign soil fighting for his country, there to remain. A 50.5 acre plot of hallowed ground lies serenely quiet near Luxembourg City. Reverence is the watchword within this cemetery for over 5000 American servicemen who paid the ultimate sacrifice for their country. White marble crosses and Stars of David, arranged in military precision in the verdant grass, mark the final resting spots for these boys from West Virginia, Ohio, Michigan, Texas, and other states who did not make it home to their mothers and fathers, wives, children and other loved ones. Fred Ocheltree, infantryman, youngest son of a respected man and a long-dead mother, a brother, a quiet friend to many who grew up catching crawdads in Oil Creek and Riffle Run, who watched the trains slowly make their way through Orlando, who watched for his father to return from work at Charlie Knight’s store, who walked to school to Burnsville from Riffle Run and was well-liked by his classmates, silently lies buried in this glade south of the Ardennes where he fell, never again to see those he loved as a child and young man. The Luxembourg American Cemetery and on the right is the marker on the grave of Fred F. Ocheltree, PFC. 301 inf 94 DIV West Virginia FEB 7 1945. That was very moving. Thank you for posting it. My father is the head of the 94th Division veteran’s association and I just dropped him a note with a link to your post. I’m sure he’ll enjoy it. My mother grew up along the banks of Oil Creek. Her family has lived there since the early 1800s. They built a community in the wilderness. Before that, some of their parents had fought the Indians, the English and the French for the land. My father (the son of German immigrants to Detroit) taught me from my very earliest memory to love and respect this exciting and honored heritage. I live in Detroit. As a kid I spent two weeks each summer in Orlando. So, while my heart might be in the right place, the rest of me is far away. As we all share our stories, facts, thoughts, documents and photos about the Oil Creek watershed- Oil Creek, Dumpling Run, Three Lick, Posey Run, Road Run, McCauly Run, Clover Fork etc., Orlando's story is being revealed, and its more exciting than any of us knew! If you have ties to Orlando, the story will not be complete without YOUR contribution. Contact us soon!